Unfortunately, due to a tight work schedule and ill planning, this Halloween was a big nada for me. Still, wanting to partake in the spook-tacular festivities of one of my all-time favorite holidays, I celebrated with my manicure and makeup look. First up, my All Hallows' Eve mani. 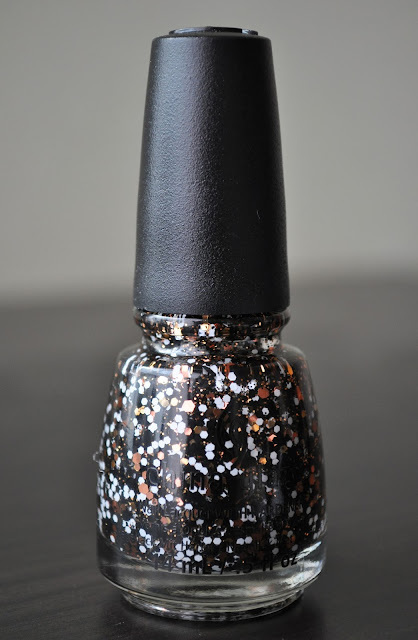 Released as part of China Glaze's 2013 Monsters Ball Collection, Boo-gie Down is a clear-base polish with black, white and orange-cooper colored micro and hexagonal shaped glitter, as well as black bar glitter. I used Dior's 707 Gris Montaigne, as the base color. I love the contrast of the gray against the other colors, and I feel it gives a spooky, crypt-like feel to the nails. What did you wear on your nails for Halloween? Another fun way to celebrate Halloween.